Creativity and Innovation requires process facilitation that inspires quality thinking and elicits quantity of ideas ~ all set in an open, supportive, creative climate / environment. 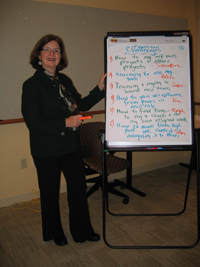 Kells Associates will design an Innovation Meeting to meet the needs of your team. We are experienced in leading creative sessions to follow up on Employee Satisfaction Surveys, for New Product Development ideas, and for Work / Cost Improvement Strategies. Changing perspective, shifting paradigms, and visioning are all tools for future thinking. The creative problem solving process uses these tools for facilitating change. It enables people rethink and recreate everyday challenges into interesting, viable opportunities. It gives them the tools to be proactive and reengineer their areas going forward. Sid Parnes describes the process by suggesting . . . “we first speculate on what ‘might be’ . . . we sense and anticipate all conceivable consequences or repercussions . . . and we choose and develop our best alternative in full awareness”. Data-finding: Searching for data and questions to help better understand goals and priorities. Problem-finding: Formulating specific questions (statements of problems or sub problems) the group might want to use to seek new and potentially useful ideas. Idea-finding: Generating as many possible ideas which could offer solutions to the problem, and then selecting the most promising or interesting ones. Solution-finding: Identifying key criteria and using that criteria for evaluating ideas to find the ones with the most potential. Analyzing possibilities. Acceptance-finding: Creating an action plan for successful implementation.